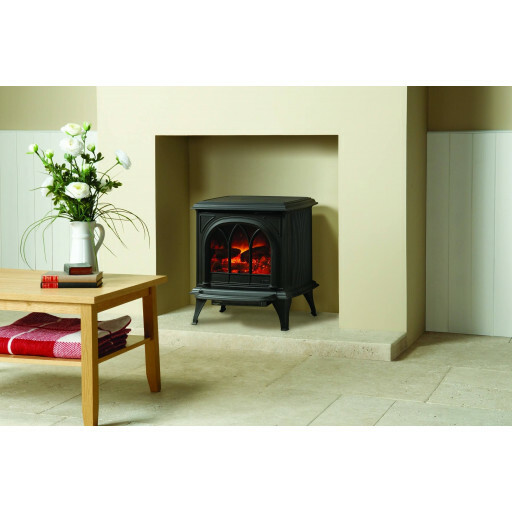 Create an instant ambiance of warmth and comfort within your home with the Huntingdon 20 electric stove. Available in a variety of colours, including enamel ivory and matt black, it will complete virtually any existing decor. Select from a clear door or a tracery door, both of which allow you to see the gently rolling flames within. Made of the highest quality materials, this electric stove is designed to be functional and aesthetically pleasing as well. It's designed with convenience in mind too with the included remote control unit allowing you to dim the brightness of the flame effect and control the temperature quickly and easily. The log-effect fuel truly does mimic the sensation of a real wood-burning stove so that you can have as near an authentic experience as you get without actually burning real wood. Regardless of whether your home has a modern or traditional design theme, the Huntingdon 20 electric stove can work with your space. Innovative and practical, the stove can provide a bit of vintage flair to any room it's placed in. Since it doesn't burn real wood, you won't have to worry about all the maintenance and upkeep that's associated with a real wood-burning stove. Instead, you can bask in a comparable counterpart that requires minimal effort on your part and can brighten your day and night sufficiently.